Back on the Market! 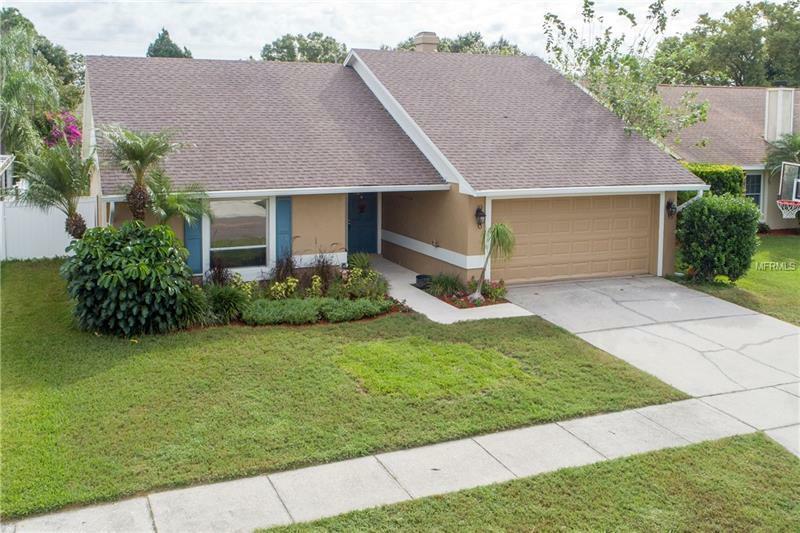 Are you looking for a MOVE-IN READY POOL HOME with 3 bedrooms, 2 UPDATED BATHROOMS, a NEWLY REMODELED KITCHEN and a 2 car garage on a FENCED LOT in a HIGHLY SOUGHT AFTER NEIGHBORHOOD? Look no further. This home will not disappoint. This GREAT ROOM PLAN home with VAULTED CEILINGS feels LARGER THAN THE SQUARE FOOTAGE SUGGESTS. Not a fan of carpet? This home has CERAMIC TILE THROUGHOUT. You’ll enjoy the galley style kitchen that was REMODELED with new 42” MAPLE CABINETS, GRANITE COUNTERS, STAINLESS STEEL APPLIANCES, HERRINGBONE TILE BACKSPLASH and pantry closet. This home has been VERY WELL MAINTAINED and BOASTS BRAND NEW GUTTERS, A/C 6 YRS OLD, NEW EXTERIOR PAINT, NICELY LANDSCAPED AND MORE. Like to spend time outdoors? You are going to love spending time by the OVERSIZED POOL with a DIAMOND-BRITE QUARTZ FINISH (lasts much longer than marcite), an EXTENDED & COVERED LANAI with a “STRUCT-ALL” HEAVY DUTY ROOF COVER and most of the lanai screens have been repaired/replaced. 2 bedrooms share a REMODELED BATHROOM with a CUSTOM VANITY AND GRANITE COUNTERTOP. The MASTER BEDROOM IS GOOD SIZED (14x12) with POOL VIEWS and a REMODELED BATHROOM with PORCELAIN TILE and CUSTOM CABINET VANITY. Homes in this neighborhood sell fast...so dont delay on this one!